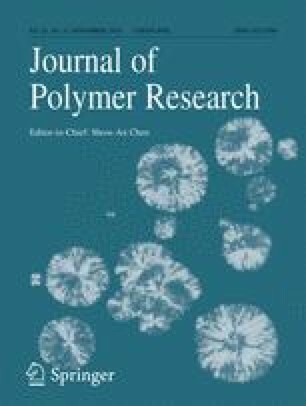 In this study, poly(vinyl pyrrolidone) (PVP) polymeric fibers were obtained by the solution blow-spinning (SBS) technique using PVP of low molecular weight. The fabrication of nano-microfibers of polymers with low molecular weights by using the SBS or electrospinning (ES) techniques is not common. Most theoretical studies suggest that only high-molecular-weight polymers can be produced because of their rheological properties. The influence of solution parameters (concentration, solvent volatility, and viscosity) and processing parameters (injection rate, collector rotation, gas pressure, and needle size protuberance) on the formation, morphology, and physical properties of the PVP fibers was investigated using the images obtained by scanning electron microscopy (SEM), thermal analysis (DSC/TG), x-ray diffraction (XRD) patterns, and Fourier-transform infrared spectroscopy (FTIR) spectra. The results showed no significate changes in the polymer properties because of fiber processing. Additionally, the fiber diameter frequency distribution was analyzed for each condition studied, and the behaviors of the fiber diameters with higher occurrences were evaluated as a function of the variables in the study, revealing that there is no simple relationship between the fiber diameter and processing conditions. The online version of this article ( https://doi.org/10.1007/s10965-018-1633-0) contains supplementary material, which is available to authorized users.